Reviews of The Sagas of Noggin the Nog! On the road … number 1. The Hawth has been Nogged! The Lighthouse has been Nogged! Norden Farm has been Nogged! Hi, Noggin the Nog, I liked when Noggin the Nog and Thor Nogson climbed onto the dragon. It was very funny. I am 5. 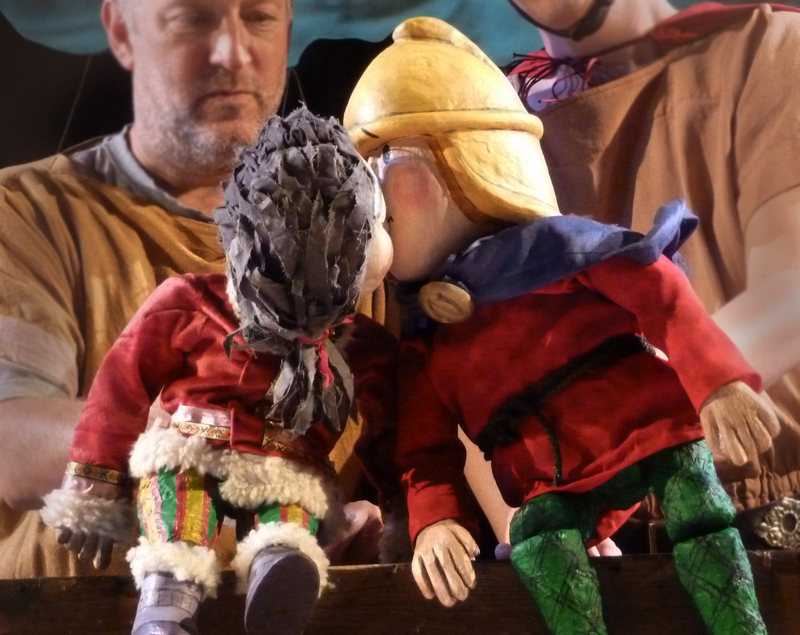 If you stroll across to the “Where and When” page on this blog you will be able to see that we have been touring “The Saga of Noggin the Nog” for a few days now … we started at The New Wolsey Theatre, Ipswich and we are currently in the van on the way to Telford (so it must be Wednesday). It is ridiculously cold; I know this because we have just stopped for a comfort break (or a wee, as we used to call it) and during the short walk between the van and the most expensive (and yet somehow still, unbelievably, below average) cup of coffee known to man, my teeth chattered so hard I was in danger of rattling my NHS fillings into dust. So, how is it going? Well, to be honest it is going better than we could have hoped for … audiences are very excited about the show; they love it. It is going down a storm, as can be seen from the unsolicited comments from audience members above. 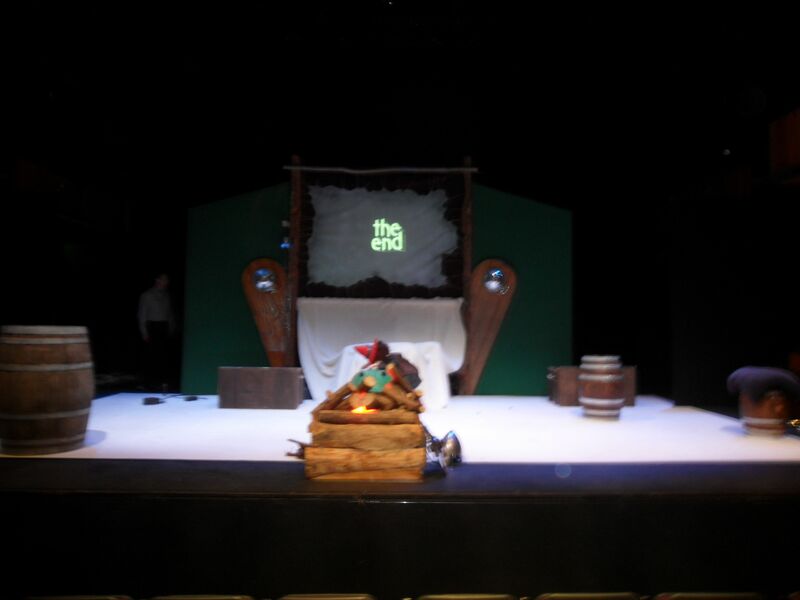 It is a good show; it is funny, it is great storytelling, its exciting and, as Jane Corry, Director of Norden Farm, said after the performance, “it is a visual feast”. We always work very hard on maintaining high production values. 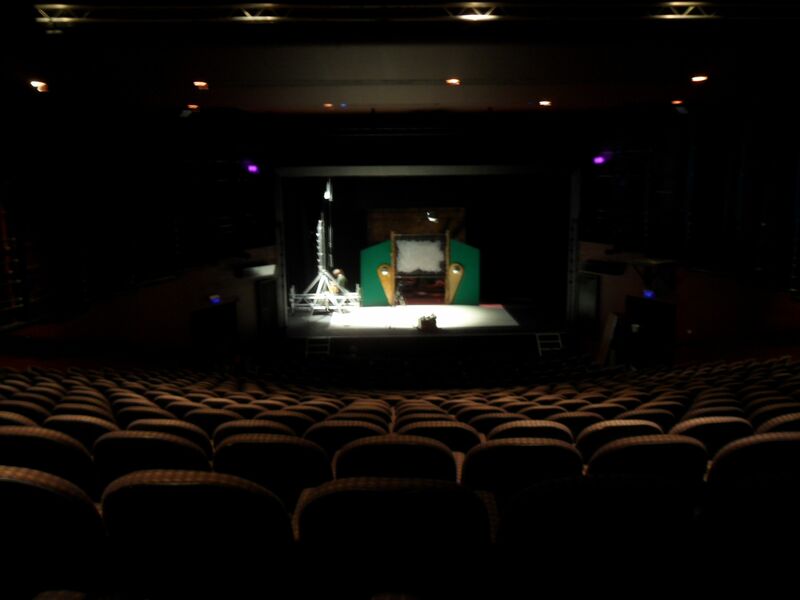 It seems to be a surprise to many venues just how good the show is and how much audiences are enjoying it, and that in itself is quite exciting but it also gives us a problem; how do we let audiences and venues know just how good it is! We’ve talked about putting a short section of the show on You Tube or Vimeo but a video just doesn’t capture the relationship that we build with the audience, which is very much a part of the beauty of the show; it is this relationship that we have with audiences that draws them in, allows them to relax and to be very much a part of the event. Also, and let’s be honest here, we have all seen some fabulous videos of productions where, unfortunately, the video is better than the show … often a lot of style over content. A good video does not a good theatre performance make. Snogging the Snog: Noggin and Nooka of the Nooks. The beauty of “The Saga of Noggin the Nog” is that it is a good , well made show whether you are familiar with Noggin the Nog or not. For some “old-timers”, there is a nostalgic extra to the show but for others who have never seen or even heard of Noggin, it is still a fabulous hour and ten minutes. 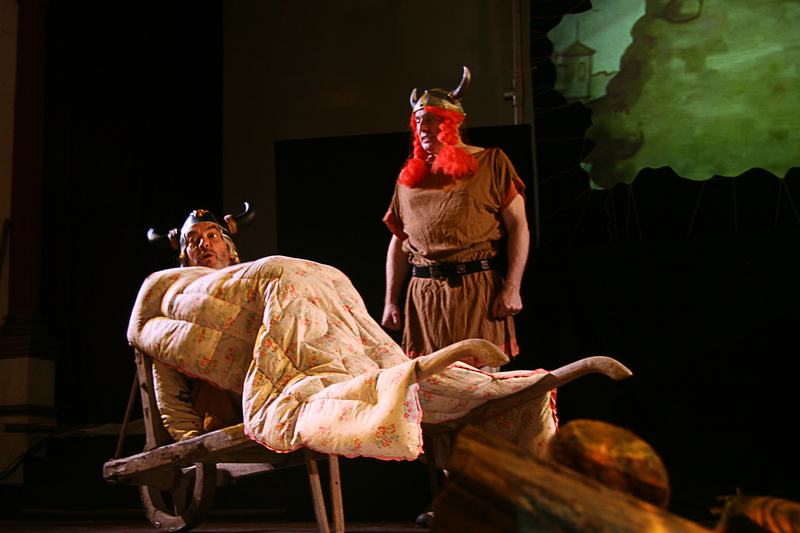 Our audiences have comprised hardened older Noggin fans with their grandchildren (and sometimes without their grandchildren), young families who have read the books or seen the DVDs and some who have never heard of Noggin the Nog … and they all seem to enjoy the show with the same fervour. Grunehilde the Lazy One and her maid, Ignora. I am at the moment sitting in the dressing room at the Oakengate Theatre in Telford and, on stage, people dressed all in black are running up and down ladders, shouting indecipherable techie things at each other and generally being “jolly good eggs”. The show will look fabulous in here. So, if you haven’t been Nogged yet … have a look at the touring schedule and find a venue near you. 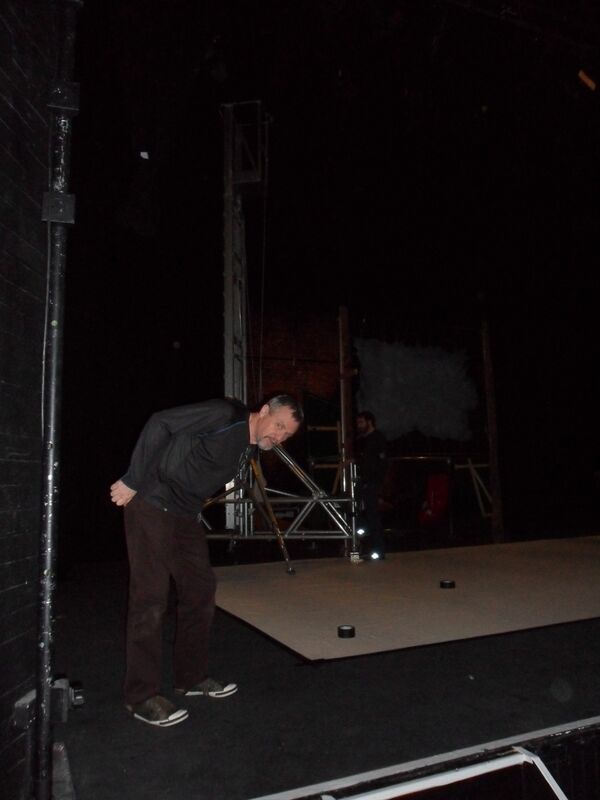 We will be touring again, later in the year, so if you can’t find a convenient venue … keep watching this space. Noggin the Nog on Youtube.